Students in Mrs. Thompson's 1st grade book club are learning new words! Students were given many different mediums to show Mrs. Thompson how they knew the word "can". 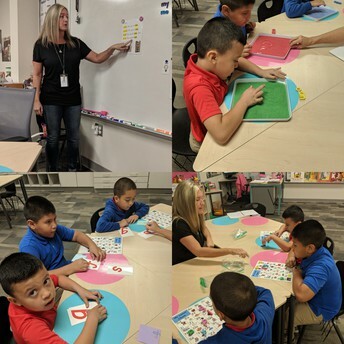 They were given raised letters to trace, sand to write the words, dry erase to write the words, and pointed to the words on an alphabet chart. They also repeated and sounded out the words individually and together. This highlights the SIOP component, Comprehensible Input as students were given alternative forms for expressing the understanding for information and concepts. These hands-on activities were used to reinforce the concepts and information presented. 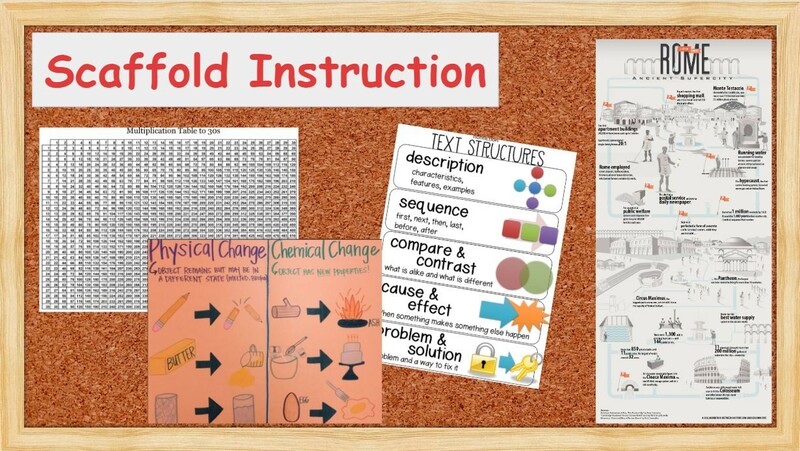 Use Visuals for Scaffolding Instruction - These visuals would allow the content to be accessible and understood. 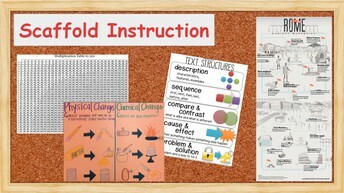 Examples might include a multiplication chart in math, a table with examples of physical and chemical changes in science, a timeline with vocabulary and pictures to reference during a unit about Rome in social studies, or an anchor chart to describe the different kinds of text structures in language arts. Use Visuals for Clarifying and Making Connections - These visuals help students understand the concepts because it clarifies a difficult topic and makes it easier to understand or allows for reminders and connections to be made between the visual and the concept. 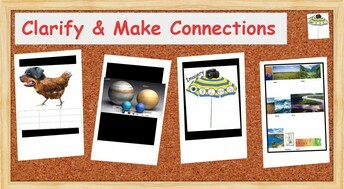 Examples might include math operation symbols next to the words, an illustration with the planets compared to each other in size for deeper understanding in science, pictures of the different types of land features in social studies or the picture of an umbrella to demonstrate the five senses can all be used under the "umbrella" of imagery in language arts. Sometimes the best connections are crazy and outside the box! 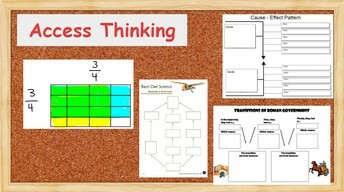 Use Visuals for Accessing Thinking - These visuals allow the teacher to observe what the student is thinking and show their understanding of the content even if the verbal or written language isn't always present. Examples might include an illustration of how the math problem was solved, a food web that must be filled in for science, filling in the missing parts of a time line in social studies, or a graphic organizer with illustrations of cause and effect in language arts. This feature allows students to create their own visuals and sentences for vocabulary and is found in Pear Deck. Great for any and all ages! The Office of Assessment has released updated accommodations guidance entering the first year of ILEARN. First, Spanish translations & glossaries – new features for ILEARN – and their impact on ELs and fluent bilingual students are addressed. Also included is new guidance on bilingual dictionaries, which now allows for more flexibility on which can be utilized. This guidance is located on pages 38-41 in the updated Accessibility and Accommodations document. Maria was born in Guatemala then moved to New York with her family when she was 8 or 9 years old. 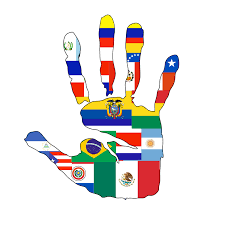 Having entered the New York school system as an EL student herself, Maria vividly remembers taking numerous required tests to exit the program. Empathy for our Perry Township students comes naturally to Maria. In 2007, Maria, her husband, daughter, and son moved to Indiana for a new adventure. After working in various medical and dental offices, Maria decided to apply with Perry Township because her children also attended schools here. She has been with the EL department for the last six years. Maria’s favorite part of the job is helping parents and she feels most accomplished when she can help them resolve a problem. Being there for parents and staff is her greatest joy. Maria prefers to work with a team and support all of the individuals she works with. In her free time, you will find Maria relaxing, dancing, or listening to music (especially salsa or merengue). Maria’s favorite pastime is spending time with her family watching movies and going out to eat. She enjoys trying new restaurants and although her husband always orders the standard burger, Maria prefers to try new dishes which she sometimes finds herself regretting. Our office would not run as smoothly without Maria - we are so glad she is part of our EL family! Many countries do not celebrate Halloween. Please speak with your students about their right to participate or not. Some universal signs for not participating are: door closed, lights off, blinds drawn, and not answering the door. This emphasizes one of WIDA's Guiding Principles that students’ languages and cultures are valuable resources to be tapped and incorporated into schooling.